Dubai, 15 September 2018: The Hamdan Bin Mohammed Heritage Center (HHC) has announced that registration for the 5th edition of the annual Camel Trek, which will take place from January 16 – 25, 2019, is now open. “The trek which is open to all nationalities will cover a total distance of around 500km, traversing through the vast expanse of UAE desert, giving the participants a perfect opportunity to learn the rich Emirati culture and old ways of the Bedouins,” said Hind bin Demaithan Al Qemzi, HHC Director of Events, during a briefing held recently at the Youth Hub at Boulevard Jumeirah Emirates Towers. Ms. Al Qemzi explained that the HHC will provide all the necessary logistics for the entire trek, including the camels, tents, food and other provisions, and a medical team on standby. 'No prior experience is required but participants must undergo a training program at our camel farm in Al Nakhra, off the Dubai-Al Ain road,” Ms. Al Quemzi underlined. 'There will be many challenges that’s why it is very important, especially for the first-timers, to learn the different tasks at the camp. They will know how to take care of their own camel, saddle, tether and feed it,' she added. Ms. Al Quemzi also emphasised that participants will also be shortlisted based on the training they have received as it is important for them to finish the entire 11-day desert trek. Training at the Al Nakhra camel farm will be held weekly on Sundays, Mondays and Tuesdays from 5pm until 8pm, and the participants can choose the most appropriate dates for them or all of the days if they prefer. 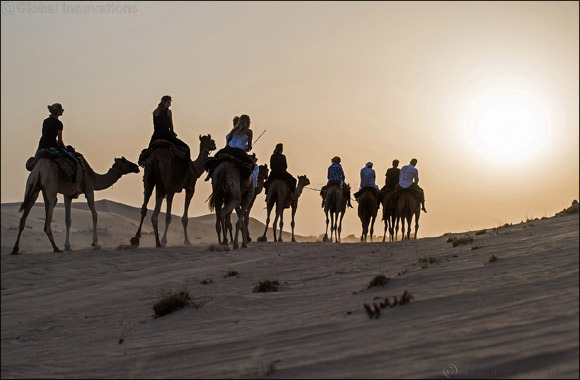 Previous participants – coming from various nationalities, including Europeans, Arabs and Asians - have avowed of the wonderful things and memories they had experienced in the desert. Those who would like to join the 5th edition of the Camel Trek, organised by the HHC, can send email to info@hhc.gov.ae with the subject: Camel Trek 2019.